Sound waves are changes of pressure (fluctuations of density) in a medium. In the medium of the terrestrial atmosphere, sound waves spread out as so-called longitudinal waves, by forwarding of the pressure change in the propagation direction. Infrasound is the part of the sound spectrum below the human hearing threshold, at frequencies below 20 Hz. The causes of infrasound in the atmosphere are many: animals, wind turbines, earthquakes, volcanoes, sea waves, thunderstorms, wind, trucks, helicopters, nuclear weapons tests, etc. Even bright meteors and fireballs create a sound wave when they collide with the Earth’s atmosphere. Table 1 – Stations of the Swiss Meteor Network are recording and analyzing infrasound signals. For the location, please visit http://meteorastronomie.ch/images/Karte_Beobachtungsstationen.jpg). Usually infrasound waves caused by meteor events are weak signals. Often, a meteor event generates an amplitude, which is similar to the noisy signals. Most of the noise is generated by the wind. That’s why it is necessary to apply an effective wind noise reduction. According to the literature, the use of a noise averaging system is proposed. After some tests, the stations of the FMA apply different equipment. This allows to compare the different methods of noise reduction. Instead of the commonly used non-UV-resistant tubes, the noise averaging system was built in a more robust way. The noise averaging system consists of a center part and 18 pcs. of radial tubes, all made of aluminum. The tubes have a length of 2.00 m and the ends are still open. In the future, the ends will be covered with a kind of filtering material. Further, the center part is equipped with two output tubes: One for the Infiltec Infra20 sensor and another one for the Raspberry Boom sensor. Figure 1 – BOS, Observing station Bos-cha. Figure 2 – BOS, Observing station Bos-cha. Figure 3 – BOS, Observing station Bos-cha, the center part with two output tubes: One for the Infiltec Infra20 sensor and another one for the Raspberry Boom sensor. The length of the tube is 15 m, internal diameter is 16 mm. One end of the tube is closed, the other end is attached to the Infra20 device. Figure 4 – GNO Osservatorio Astronomico di Gnosca with the Claber tube on the ground. Figure 5 – GNO Osservatorio Astronomico di Gnosca with the Claber tube on the ground. Instead of an averaging system, a noise reduction system was applied. It consists of a microphone fur, as often used from street reporters during windy weather conditions. The end of the infra20 tube is open and is simply plugged into the fur. Figure 6 – ENT, Observing station Entfelden and its noise reduction system. Figure 7 – VTE, Observatoire géophysique Val Terbi. On October 9, 2018, at 01:48:51 UT, a bright meteor occurred over Switzerland. Numerous stations of the Swiss Meteor Network recorded the meteor by different methods: All-sky pictures, video sequences, audio signals (forward scattering) and spectroscopic recordings. Due to the numerous observations from different observing sites, Beat Booz was able to triangulate the trajectory of the meteor. According to the calculations, the fireball entered the Earth’s atmosphere with a velocity of 38 km/s and a tilt angle of 56°. The meteor started at the height of 118 km. At an altitude of about 72.6 km, it exploded in a bright double flash. The remaining parts and the afterglow could be recorded down to height of 63 km. The trajectory occurred completely over Switzerland. The meteor ended because the material was completely ablated. That is why no mass fall is expected. The recordings and calculations are available under http://meteorastronomie.ch/detaildatafk.php?id=112. Figure 8 – Meteor event October 9, 2018, at 01:48:51 UT, starting at 118 km and ending at 72.6 km elevation. Figure 9 – Meteor event October 9, 2018, at 01:48:51 UT, had its trajectory entirely over Switzerland. At the end of the visual recording, a bright double flash was detected. It is assumed, that the double flash occurred by an explosive fragmentation of the meteoroid, shortly before it disappeared. The explosion was timed at 01:48:52.8 UT. At this time, the meteoroid was located on 46.73° N, 8.27° E, in a height of 72.6 km above sea level. According to the calculations of Beat Booz, the explosion is localized at 46.73°N, 8.27°E, height 72.6 km. It is further assumed, that the sound waves started from this “point of explosion” in a spherical shape in all directions. It is also assumed, that the sound waves spread in a straight line (no refraction of the sound waves was considered). During the meteor event, the infrasound recording stations BOS, GNO, VTE and ENT were in operation too. It was suspected, that the explosion generated some infrasound waves. Depending on the distance between the “point of explosion” and the observing station, the infrasound signals should arrive at the stations at different time. The following results in Table 2 show the expected delay of the arrival of the sound. The base of the calculations is the standard model of the atmosphere referred to the velocity of sound in dependence of the temperature in different heights. Table 2 – Times of expected arrival. Figure 10 – The infrasound recording of station BOS: expected time: 01:57:22 UT. Figure 11 – The infrasound recording of station VTE: expected time: 01:55:03 UT. Figure 12 – The infrasound recording of station ENT: expected time: 01:54:20 UT (no detection but noise). Figure 14 – The infrasound recording of station GNO (zoomed): expected time: 01:54:38 UT. Because it seemed possible, that the infrasound waves could have been recorded by the seismic sensors of the Schweizerischer Erdbebendienst (SED), we asked for the data of the nearest stations, see Table 3. Table 3 – Near stations of the Schweizerischer Erdbebendienst (SED). Many thanks to Mr. John Clinton and Mr. Tobias Diehl from SED for the seismic data. Figure 15 – Overview about the involved recording stations: Stations of FMA (yellow marks), Stations of SED (blue marks)and end of the meteor (height 72.6 km) (red mark). Figure 16 – Overview about the involved recording stations: Stations of FMA(yellow marks), Stations of SED (blue marks)and end of the meteor (height 72.6 km) (red mark). 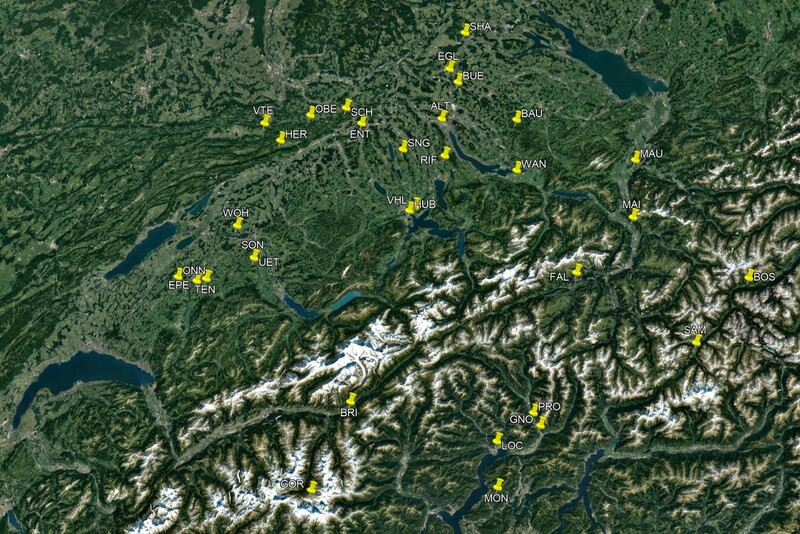 Figure 17 – Seismic recordings of the nearest stations of Schweizerischer Erdbebendienst (SED). 1) The present meteor event was accompanied by a bright (double) flash at the end of the visible trajectory. In fact, this flash marks an explosive fragmentation, which causes the spread out of sound waves in a wide audio frequency spectrum, including infrasound range. 2) The existence of an explosion allows to determine a single point as the starting point of the sound waves (instead of the line path along the meteor’s trajectory). And further, it can be assumed, that the sound waves start from this “point of explosion” in a spherical shape in all directions. 3) The comparison between the expected and recorded time shows, that the applied calculation method (iteration of the way of sound wave from the starting point to the observing site; by steps of 1 sec.) is well usable for a rough estimation. Hereby, the different velocity of sound waves, depending on the temperature in different heights, was considered. The result of the calculation is the delay between the time of explosion and the time of arrival of the sound wave at the observing site. 4) For the present case, the accuracy is about +/- 1% resp. +/- 2 seconds resp. +/- 620 m in distance. This is in line with the accuracy of the position, determined out of the video sequences. Station BOS: + 1.6 sec. 6) In a first approach, the herein applied calculation doesn’t consider the influence caused by wind. Further investigations are necessary to estimate the influence of the wind. 7) Because of the limited accuracy of the localization of the “point of explosion” and the relative short distances, the calculation were made considering a flat surface of the Earth. For further calculations, the spherical shape of Earth shall be considered. 8) Further, the present meteor event shows also, that it is possible to make some rough triangulation out of the infrasound data. This circumstance can be important in cases where no visual or video data are available. Examples are meteor events during daytime or when skies are clouded out. 9) Depending on the distance to the observing site, the amplitude of the signal is decreasing in an exponential way. An effective noise reduction or averaging system is eminent important. It allows to distinguish better between noise and signal also in a far distance. 10) Base of all recordings and calculations is an accurate time keeping system of all participating stations.